The New Zealand Handball Federation is looking to appoint a National Youth Development Manager based in Auckland, initially on a part time basis. Purpose of the role: To facilitate the establishment and growth of handball in secondary schools throughout New Zealand. This role will work closely with the current regions where Handball is played in New Zealand and to begin with, will focus on growing the sport in Auckland. The role will directly contribute to achieving NZHF’s overall strategic goals of growing to 5000 players in 5 years. Ideal Candidate: We are seeking someone with enthusiasm for, and knowledge of, Handball. The successful candidate will have experience in developing and managing sports programmes, with particular emphasis on junior sports development. Preferred, but not essential are a Police clearance to enable work with youth in schools and a current First Aid certificate. Gathering membership statistics and administering the NZHF Membership Database. Location and hours of work: This is a part time position in Auckland. Hours of work and base of operations to be negotiated with the successful applicant. We anticipate the role will initially run for 6 months from October 2018 until the end of the first school term of 2019, but if funding can be found, the role will be extended. A full job description is available on request. To register your interest please send your CV and details of your suitability for the role to secretary@handball.org.nz no later than 1 September 2018. National Team manager – Men’s Squad. Appointment of the both squad managers will be immediate, but the women’s appointment will understudy the current manager until mid-December 2018. Strengths in sports team management/administration. Ability to ensure clear and efficient communication to all key personnel. Efficient management of all arrangements, and attendance at, training camps and tournaments both in NZ and overseas. Effective team management during Tournaments. Efficient management of all kit and resources including liaising with uniform suppliers. Able to maintain effective team harmony during camps and competitions. Meet NZHF reporting requirements at the end of each tournament. Apply in writing outlining your experience and suitability for the role prior to 1 September 2018 to the NZHF, addressed to the Secretary-General: secretary@handball.org.nz attaching any relevant documents. Co-ordination of monthly training camps – all age groups. Preparation for, and attendance at, the Australian State Championships in October. Preparation for the NZ Under 18 team which will compete in the next round of the IHF trophy in early 2019 (expected in March at an international venue to be confirmed). Planning and co-ordinating the next two year’s campaign which will culminate in the Asian Championships in 2020 . Preparation for, and attendance at, the Australian State Championships (or alternative) in 2019. Planning and co-ordinating the next two year’s senior women’s campaign which will culminate in the Asian Championships in 2020/21. Notice is given that the NZ Handball Federation Annual General Meeting will be held at the ASB Sports Centre, Kilbirnie, Wellington following the conclusion of the day’s play at the NZ National Club Championships on Saturday 15 September 2018. Nominations are also sought for membership of the NZHF Executive Committee. Nominations must be made on the approved nomination form and reach the NZHF Secretary-General by email to secretary@handball.org.nz no later than 7pm Thursday, 16 August 2018. Nomination forms will be emailed to affiliated clubs, or can be requested from secretary@handball.org.nz. A draft agenda will be made available 30 days prior to the AGM and any members may suggest changes to the proposed Annual General Meeting Agenda Items. A written notification of the suggested changes to the proposed Annual General Meeting Agenda Items must be given to the NZHF Secretary-General by email to secretary@handball.org.nz no later than 7pm Friday 31 August 2018. The final agenda and meeting arrangements will be notified on 1 September 2018. NZHF NATIONAL CLUBS TOURNAMENT will be held in Wellington from 14-16 Sept. Invitations are extended to all NZ Clubs and to any clubs from Oceania who might wish to join us. Click on the links below for event information and registration form. Note: NZ Clubs must be fully affiliated financially to NZHF to be eligible to enter. If your annual fees are in arrears, then get them paid asap please. Thanks to Wellington Handball for hosting this tournament. Click here to read the IHF article and see the results of all games in the U18 and U20 sections of the Oceania IHF Trophy held in New Caledonia in June 2018. 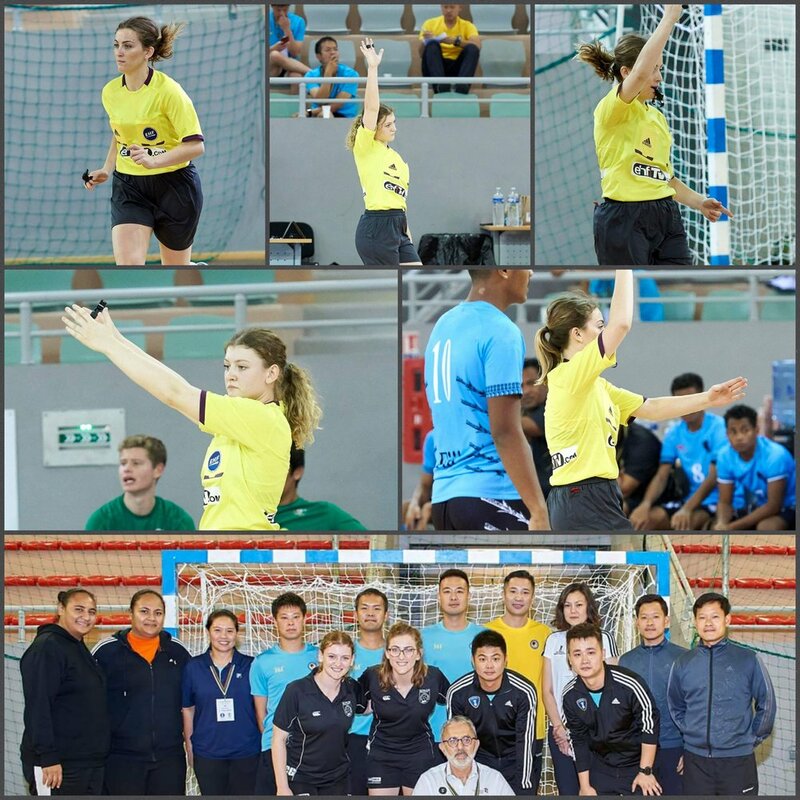 New Zealand referee pair, Bella Anastasiou and Maddy Hazelton, were invited by IHF to referee at the recent Oceania IHF Trophy tournament in New Caledonia. 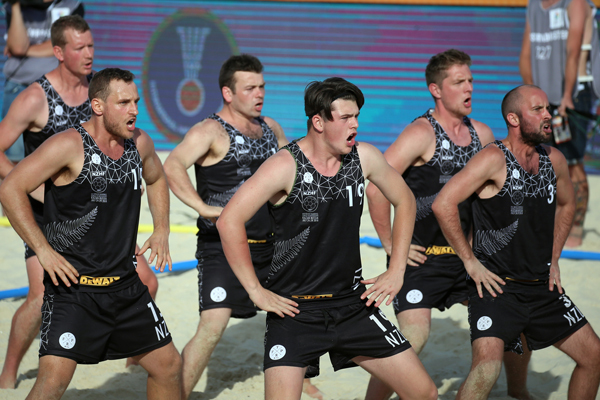 We are delighted to announce the team and officials who will represent New Zealand at the IHF Beach Handball World Championships to be held in Kazan, Russia in July 2018. We wish the team and officials all the best with their preparation, and great success at the tournament.